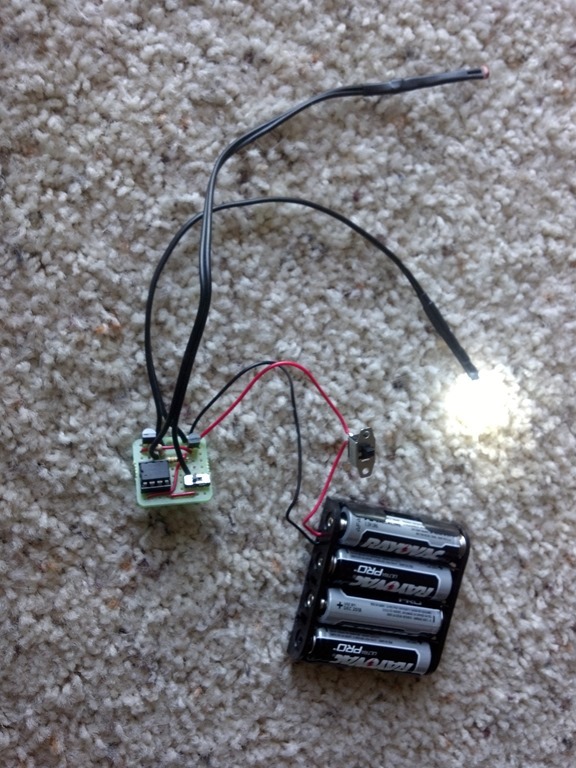 I started with the idea I needed to light an LED and make the brightness change over time. Lighting an LED via Arduino is pretty easy: connect it between an Output pin and ground then set the pin high or low. To vary the brightness, the output pin needs to be capable of pulse width modulation (PWM). PWM allows us the ability to determine how long the pin is set high over a given duration (the duty cycle). For example, if power is output over only half of the period, the LED Is half as bright as If power was output over the whole duration. Check out this site to learn more about how PWM works on the Arduino. It has many other uses besides dimming an LED. This video shows the PWM signal on the oscilloscope and the corresponding LED. Hopefully this demonstrates what PWM does and what the signal looks like. One interesting thing shown on the scope is as the duty cycle increases, the voltage drops. This is because the LED has a greater draw as the brightness increases. Once the proof of concept was working, I needed to figure out how to downsize and cheapen it up a bit. This led me to the PICAXE platform. I found it is relatively cheap and easy to work with. The chips (08M2s) are about $3 each and don’t require (too much) special hardware to program. PICAXE also uses a BASIC like language or can even be programmed using a flowchart method. Score tow points for PICAXE. Switching to the PICAXE let me incorporate a few more features also – also possible on the Arduino, I just didn’t do it. I added in a CdS cell to detect the ambient light. This disables the light house if it is too bright. There is also a switch to put it into a ‘debug’ mode which lights up the light. The brown out detection and sleep code puts the PICAXE into a lower power state so it can remain switched on and not drain the battery as fast. I haven’t measured so I have no idea how much this actually extends the battery life. PWM on the PICAXE is a little more controllable as you must define the period and the duty cycle whereas the Arduino only needs the duty cycle defined. The period is how much time for the on/off sequence and the duty cycle is how much of that time is on. Check out this site to learn more about PWM on the PICAXE. In my code above, the period is 199 and the duty cycle varies between 5 and 300 with a pulse to 800. The period must be between 0 and 255 and the duty cycle must be between 0 and 1023. Voltage across the CdS is read into a variable and analyzed – any value above about 100 is too bright for the light house to be visible so it automatically shuts the light off, goes into a low power state, and checks again in about 2 minutes. You can see in the code we can vary the stepDelay or fadeAmount to produce many different lighting patterns. Increasing or decreasing the stepDelay will lengthen or shorten the flash sequence. Changing the fadeAmount within the if statements will also change the sequence speed but can also affect how the light looks if the steps are too large. The CdS and LED are on remote wires to be run to the outside of the light house, the circuit is built on a 1 inch square of perf board, and the power switch and battery are able to be mounted near by. This is the large version for my 18 inch tall light house. The smaller versions, for the 4 inch tall and 10 inch light houses, are the same circuit with different battery packs. The mid size is running on 3 AAA batteries and the smallest is running off a single higher voltage battery.